With the holidays approaching and the economy on the downturn, I’m sure I’m not the only one who feels the pinch in my wallet. There’s not much you can do to lower rent or mortgage, utility bills, or car payments, so your food budget will likely be what gets cut back. If the thought of eating nothing but rice and beans for your holiday meals scares you, don’t worry! You can trim your food budget while still eating well and keeping it green. In fact, there are many ways to lower your grocery bill while helping the planet out at the same time. Following are some of the ways I’ve tampered my food spending, but please comment with your money (and earth) saving ideas! Cut down on the processed and convenience foods on your list. Usually the more processed and packaged something is, the more it costs. Why not be adventurous and try making more from scratch? Buy whole foods and avoid wasteful individually packaged convenience foods. Snacks are a major culprit for overspending, so try making your own trail mixes, snack bars, and cookies instead of buying pre-made ones. You can also cut back on other expensive food items, like meat and cheese. Now is a great time to explore a vegetarian or vegan diet, which can save you money as well as protecting your health and the environment. Veggies, beans, and tofu are much cheaper protein sources than meat, and they don’t come with the cholesterol and saturated fat that animal products are laden with. Trust me, it’s not nearly as hard as you think it is to adopt a healthy vegetarian diet and quit meat cold-turkey. I’d be happy to answer any questions you may have, just leave a comment. The bulk bins are your friends. 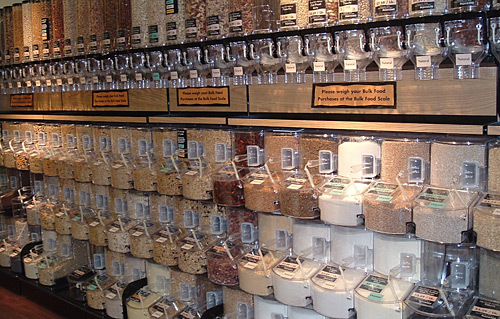 Many grocery stores and almost every natural foods store has bulk bins, with everything from basic beans and grains to sugar, cereal, and nuts. My co-op even has tortilla chips, peanut butter, and olive oil in bulk. I re-use glass jars and cloth bags for my bulk items to reduce my use of plastic bags. I simply weigh each container (or have the cashier do it) before filling it up. I buy dry beans and soak and cook them instead of buying canned beans at a fraction of the cost. Try the bulk soup mixes for quick lunches instead of using canned soup. Bulk items are usually much cheaper, plus you can buy just what you need so there’s no waste. Although it’s best to eat all organic, not everyone can afford to eat 100% organic all the time. Choose locally grown foods and look for those that are “unsprayed” or basically organic but without the certification. There are some foods that when conventionally grown are likely to have high pesticide residues, and you should try to stick to organic options for these “dirty dozen” foods. Speaking of local food, many local options are cheap because there isn’t as much cost associated with shipping and packaging. Browse your local farmer’s markets, meet your gardening neighbors, and look into joining a CSA (Community Supported Agriculture) program. Grow your own! Organic gardening is in, so join the revolution and grow some food, on whatever scale you can. Even a few pots of herbs on a windowsill will save you money. Chives, cilantro, parsley, basil, oregano, thyme, sage, and mint are all relatively easy to grow and do well in containers. You can just snip what you need instead of having to buy a whole package of fresh herbs only to have half of them go bad. Turning part of your yard into a garden is a great way to enjoy the outdoors, get exercise, and save on groceries. If you have no yard, consider joining or starting a community garden, or grow in containers on a balcony, the roof, or indoors. Winter gardening is possible in many climates with the help of a greenhouse or inexpensive hoop houses or cold frames. There is nothing more rewarding than being in complete control of how your food is made, from seed to plate! Cook at home with whole foods rather than eating out. If you’re short on time, try dedicating one day eas weekend as your cooking spree, and prepare and freeze meals for the week. Buying bulk foods and planning meals ahead of time based on what ingredients you already have can help make home-made meals cheaper. Make larger portions than you’ll eat in one meal if you will eat the leftovers. I eat leftovers for lunch almost every day. And speaking of lunch, brown bag it instead of going out to lunch. Pack leftovers, salads, fruit, and snacks in reuseable containers (or get yourself a snazzy lunch box if you want). If you don’t have much time in the mornings, get in the habit of packing your lunch the night before so you can just grab it out of the fridge on your way to work. Home brew to the rescue! This goes for tea, coffee, and even wine or beer. You can buy loose coffee and tea in bulk, and prepare it in the mornings for your caffeine fix instead of waiting in line at the coffee shop. Brewing your own will not only save you a bundle, but it will prevent you from using wasteful paper cups. Learning to brew beer from home is quite an adventure, and if you love a good microbrew like me, it can save quite a bit of dough. I sanitize and re-use bottles, and got everything I need to brew organic beer from Seven Bridges Cooperative in Santa Cruz, CA. The equipment to brew costs a bit up front, but will easily pay for itself with use. Homebrew makes a great green holiday gift! When grocery shopping, plan your meals and make a list ahead of time. Be thrifty and check out your store’s specials and plan meals around what’s on sale. Take a lesson from my mother and be a coupon snipper! If you find something on sale that you use often, stock up! You can always can, dehydrate, freeze, or otherwise preserve it for later use. Eat simpler meals. I usually have several types of grains, beans, and veggies on hand. All I need to do for a quick meal is make some rice or quinoa, saute some veggies, and add spices and liquid for sauce to flavor it. Throw in some nuts or beans, add a salad from the garden, and dinner’s done! You don’t have to give up eating green or eating well to shave dollars off of your grocery bills. Hopefully putting some of these ideas into practice will be a blessing to your wallet and the earth this holiday season and beyond! Previous article What to Drink with Your Turkey? Next article Urgent: Sign USDA Petition Demanding Stronger Regulations for Genetically Engineered Crops! You did a fabulous job for your first Thrifty Thursday piece. This is great advice and very doable. I do a lot of the same things myself. If I may add one piece of advice for those of us who are unwilling to go completely vegetarian. Always check the organic meat section of your store for “manager’s specials.” At most of the grocery stores around me, when a meat item is about to go past its sell by date, it gets marked down and identified with an orange sticker that says “manager’s special.” You won’t catch it every time you shop, but when you do, you can get great bargains. Buy up as much as you can afford and your freezer can hold. Don’t forget sprouts – great nutrition, small cost. Can be eaten fresh or cooked. Do not have to be purchased as ‘sprouting’ seeds. I’ve sprouted lentils then used them in salad, stir fry & soup. Look for recipes that use common, inexpensive grains – like oats and wheat berries. Cooked wheat berries make great additions to salads (marinate first), soups, added to rice. Oats can be toasted for a nutty taste or used as a side dish instead of potatoes or rice by adding herbs, making patties and sauteing. To add variety – learn what herbs & spices are used by various cuisines: Italian, French, Chinese. By changing flavors you can still eat frugally with panache. Thanks for the great suggestions, I forgot about sprouts. We have a sprouter and haven’t been using it nearly enough, but they are packed with nutrition, so it’s time to bust out the seeds. This is great! I adore bulk bins. Urgent: Sign USDA Petition Demanding Stronger Regulations for Genetically Engineered Crops!